Disadvantages: “motoritis” of the hull; not one whit of interior! While the Republic of Korea Army initially was equipped by the United States during the Korean War, and for many years afterwards, over the last 25 years the ROK has moved into designing its own vehicles and equipment (albeit with external assistance and components) to create vehicles more suited for combat in Korea. This means somewhat smaller scale to better suit the smaller stature Korean soldiers, as well as more useful in the hilly and cold climate for which Korea is known. Initially their self-propelled artillery consisted of US-built M109 155mm howitzers, eventually moving to the M109A2K variant. But this was only a 39 caliber long gun with a nominal range of 18 kilometers with conventional ammunition, and not able to reach many of the suspected deployment areas for North Korean (KPA) artillery weapons. The US was not interested in upgrading to what was becoming the world standard for long range artillery, 155mm guns with 52 caliber long barrels, so in 1989 the Koreans tasked Samsung Techwin with developing a new gun with that armament. The first prototype of the new weapon, designated the K9 Thunder, appeared in 1996. 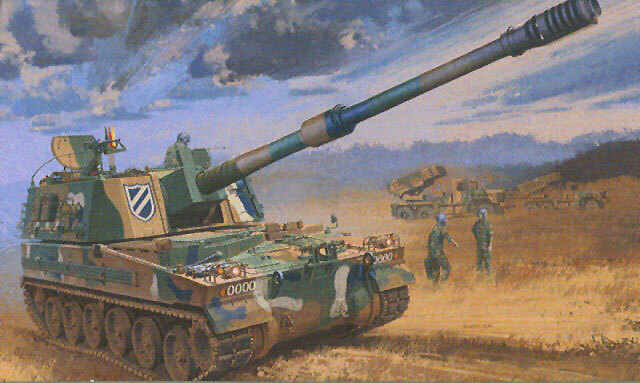 The weapon was obviously based on the same design concept as the M109A2 but had a larger turret, roomier, more optimized hull (the M109 was originally designed to float with aids and that dictated part of its design, even when the requirement was eventually dropped) and a massive 52 caliber barrel howitzer. (That is an odd description, considering howitzers used to have a theoretical barrel length of 12-25 calibers, but I digress). The commander is located on the right side of the turret and the gunner on the left, with the driver in the left front of the hull. The two loaders are in the rear of the turret. Loading is automated and the gun is capable of firing three rounds in 15 seconds at different elevations and fuse settings so all shells can impact simultaneously on a mid-range target. The gun can fire to 30,000 meters with standard NATO 155mm ammunition or with special rounds (DP-ICM, ER-BB, or BB-RAP) it can reach out as far as 56,000 meters. The gun is powered by an MTU 881 engine of 1000 HP and has a top speed of 67 kph. As of this writing the ROK Army reportly has 390 in service and as of June 2009 had ordered an additional purchase of 1,000 more guns. Each gun is paired with a K10 automated ammunition supply vehicle (the M109A2 is to the K9 as the M992 FAASV is to the K10). Fire control is automatic and the K9 is assessed by the Koreans to be superior to the US M109A6 Paladin both in range and performance. Turkey is purchasing 300 of these guns and Australia is preparing to evaluate it for purchase as well. Academy has always shown a soft spot for the “home market” and done an excellent job on Korean national vehicles, and this kit is no different. Given a very dramatic box art of a K9 in the field with a pair of K136 Kooryong 36-shot 130mm MRLs on KM813 truck chassis (another kit most American fans would love, as it is the “clone” chassis of the M809 series 5-ton trucks) with the crew shown in relaxed positions. The kit inside the box does not disappoint. The model does suffer from that old Tamiya disease of 35 years ago – “Motoritis” – with the open hull bottom and slotted final drives to accept a battery pack and electric motor. Plugs are provided to seal the offending holes as are solid final drive mounts. All wheels are well done (there are big ejector pin holes in the back, but these will not show after assembly) and move. Single run “Diehl” type highway tracks with rubber pads are provided in gunmetal vinyl. No etched brass is provided for the air intake grilles on the hull which probably should be there (it’s hard to tell but it appears to have three grilles on the top of the hull plate - I could not find photos to confirm that) nor anywhere else. There are a number of tubular structures on the vehicle (headlight guards, stowage bins) and these appear heavy, but the ones in photos also appear to be “industrial strength” and without accurate measurements I have to go on Academy’s research. Like Italeri’s M109A2 and later vehicles Academy did not provide a clear plastic windscreen or sight head for the gunner’s primary sight (parts A65-66-74) but does provide a protective shield (parts A64,A73) to cover it over and thus avoid the entire issue. The massive gun tube is formed from six parts – front and rear barrel sections in two parts, a bore evacuator, and a massive seven-chamber muzzle brake. The latter two items are “slide molded” and Russian companies should take a look at the muzzle brake – it is the same basic design as those on the D-30 and M-62T2 gun on the T-10M and beautifully rendered. The elevation drum has options for both initial issue (a) and later issue with an armored cover (b). The barrel drum is held in place with vinyl keepers to provide sufficient friction to “pose” the barrel without sag or droop. The commander’s position (another item based on the M109) has a nicely done 10-piece M2HB .50 caliber machine gun. The three figures are of the commander in that position and two figures on the ground - one carrying a plastic water can and one standing around doing nothing (something crewmen do very well from my recollections!) Each consists of a separate head, torso, legs, arms and feet, and all come in Korean armored crewman’s uniforms with “bone dome” helmets - only the commander rates goggles. The painting instructions are fine, but once again Academy lets down on markings information. The kit comes with a lovely decal sheet covering three different units and what appear to be battery markings for three different batteries (red, blue and yellow) and serial numbers, but then not one bit of information to apply them! With close to 200 items on the sheet this is not a good idea: other bits are some Korean letters and two signs for the rear baskets which would seem to be warning signs for carrying live ammo (ours always did) in Korean. The example on the box side carries decal 1 (a unit crest) and serial number 7719 1017 with yellow trim; perhaps that is for an actual vehicle with correct markings. Being that the ROK Army has at least 6 artillery brigades and 6 field artillery groups plus divisional assets this is a shame. Overall, this is a really decent kit of a relatively unknown weapon outside of Korea. Fans of NATO weapons like the PzH 2000 or the AU F-1 should like this weapon as a companion piece.